In the 1890s Loren Coburn, the most hated man in Pescadero, built the Pebble Beach Hotel overlooking the popular and locally sentimental pebble-covered beach south of the tiny village. From what we know guests never stayed overnight– except for the watchman who was there to protect the new hotel from vandalism. (Among modern conveniences the Pebble Beach Hotel offered the luxury of hot and cold water). Business associates of Coburns (perhaps anxious to take advantage of the illiterate but wealthy man) sometimes held private parties at the hotel. 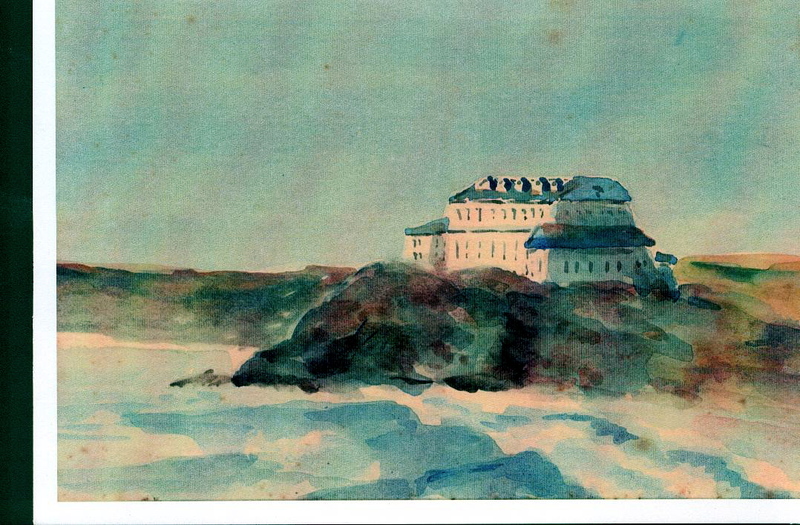 Local artist Galen Wolf wandered up and down the Coastside using his box of watercolors to preserve the past for us. Here, before it was torn down to make way for Highway 1, is Wolf’s picture of Loren Coburn’s Folly: the Pebble Beach Hotel at Pescadero where the rooms remained empty and, perhaps haunted, for decades. In 1992 I published “The Coburn Mystery”, acknowledged as a definitive history of Pescadero. Regrettably, instead of the critics focussing on the history of Pescadero, they fell into the quagmire of environmental politics. The book covers all aspects of Pescadero’s fascinating history and should be read. “The Coburn Mystery” is still available and can be purchased at Ano Nuevo State Reserve.